It's your typical July mixed-bag, something for everyone weekend in between major openers. The up and down summer continues, with nothing set to really breakout after a solid franchise film dominated last weekend. Who'd have thought, around the time of Happy Gilmore or The Waterboy, that Adam Sandler's last bastion of relevance would be in family films? It does seem to be the comic's retirement home for films (see: Eddie Murphy), though in some ways the surprising thing is that he's relevant at all. 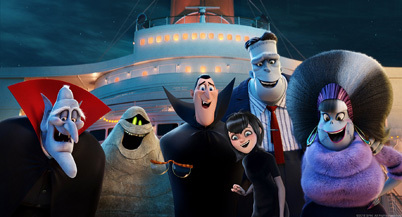 Hotel Transylvania 3 drags out the monster-themed animated series for yet another run, as the monsters take a break from running their vacation getaway for other monsters to... take a cruise. Way to branch out, there (admittedly, the movie does seem to lampshade that). While the first two movies were more focused on Andy Samberg and Selena Gomez's human/vampire romance and subsequent marriage-plus-child, this instalment moves things back to Sandler's Dracula, making it his turn to try and find love – which he thinks he has in the ship's cruise director (Kathryn Hahn), who's secretly a member of the Van Helsing family with a carefully lain trap for all of the monsters (I mean, once you've got them on the ship it's kind of simple, no?). The extended-TV show plotting (seriously, this is like a monster-themed episode of Full House) is offset by the stylish and distinctive animation and kid-friendly humor, with its audience not *yet* quite tired of this business. Three is usually a good number of entries in a series before the ideas start to run dry and the wheels fall off the wagon – sometimes you get four – but we're pretty close to the fans of this series to age out of caring about it. Absent a tolerant adult audience, it's starting to look like the later Madagascar films. The previous two films opened to solid $42 and $48 million respectively, and this likely backslides a bit from the peak, with around $44 million. It's appropriate enough for the 30th anniversary of Die Hard that we get a virtual clone of that film, at least in spirit if not quality. Skyscraper stars Dwayne Johnson (without a doubt the toughest “Dwayne” in history) as a ex-Special Forces soldier (oh and for some added ridiculousness, has an artificial leg) hired as a security expert for the world's newest tallest building, a comically large building in Hong Kong. When a group of terrorists (led by Noah Taylor, doing his best Hans Gruber) attack it, setting it on fire in the course of a robbery and framing Johnson for it. Now a wanted criminal, and with his family (Neve Campbell, making a rare return to blockbusters now that she can plausibly play a middle-aged love interest), and some lovely biracial children) trapped in the tower, he must make some herculean efforts to both save his family, clear his name and stop the bad guys from getting away. So it's standard high concept action stuff, with some rather insane stunts, highlighted by a jump from a crane into the tower thousands of feet in the air (presumably he looked at the Furious 6 super car jump and thought he could personally one-up that). It's not quite generic, thanks to the presence of Johnson, who after some rough patches, is a fairly consistent action star now, though he's best in adding to the Fast & Furious movies. There's little chance it can actually match the depth and thrills of something like the original Die Hard, though Live Free or Die Hard is maybe in the ballpark. Opening wise, compared to Johnson's other movies, this looks like it'll fall somewhere between San Andreas and Rampage, with about $37 million opening weekend.